Tonight I am all worked up about the Stanley Cup playoffs. Round one was the Washington Ovechkins vs. the New York Averys, now it’s the Crosbys vs. the Ovechkins in round two. Or that is what a casual observer may think. If you are a casual observer or have no idea what I’m talking about, here’s the superstar super scoop. Sean Avery is a punk who plays for the New York Rangers. He started the season as a punk for the Dallas Stars but after making inappropriate comments that embarrassed the management and the entire NHL, he was suspended from the league, released by the Stars and banished to the minor league. A desperate Rangers team picked him up right about the same time they fired their coach and replaced him with John Tortorella. During the first round of the playoffs with the Rangers, the only thing the commentators could talk about was the loose cannon Avery. Sidney Crosby is a girly hockey sensation who plays for the Pittsburgh Penguins. He was the number one overall draft pick for them in 2005 and he’s their team captain and resident douchebag. He has been an NHL darling before he was even eligible for the draft, all eyes have been on him. The problem with him is that he knows all eyes are on him & uses a dramatic flair to try and draw penalties from his opponents. He such a superstar that his linemates often serve as his entourage when trouble starts. I have seen him fight and it is not pretty. There are some areas of the anatomy where you just don’t hit another man, no matter the circumstances. I have seen Sidney Crosby break the guy code on this one. I could go on but you get the idea. I am not a fan. Alexander Ovechkin. What to say about the Great 8? He plays for my team and I’m afraid this is blasphemy around these parts, but I can’t help myself. I don’t like Ovechkin. He is also a superstar NHL darling but I will give him the credit that unlike Crosby, Ovie fights his own battles. Actually, I would say he is the opposite of Crosby in some ways. When someone messes with Crosby on the ice, the rest of his team comes to his rescue. On the Washington Capitals, when the other team messes with any of his teammates, Ovechkin will come to their rescue. I give him a lot of credit for that because when he is on the ice, all eyes are on him. Unlike Crosby, he appears to use his powers for good rather than evil (or whining, as the case may be.) 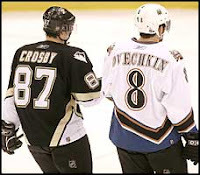 Unfortunately, Ovechkin is like Crosby in that he is a product that the NHL is selling. People don’t come to watch the Washington Capitals play, they come to see Alex Ovechkin score an acrobatic goal and slam himself up against the glass. He is always at the top of the league stats. He scored 56 goals this season, more than any other player. This certainly makes him a standout, but he also had more shots on goal than anyone else in the league. With 528 shots on goal, that puts his shooting percentage at 10.6%, that makes him #155 in the NHL rankings. On his own team, he is behind Semin, Fleischmann, Green, Backstrom and Laich. 528 shots on goal is a hell of a lot of scoring attempts. The second highest number of shots on goal in the NHL was Eric Staal with 372. Ovechkin made 156 more attempts than the second highest player, and Staal played 3 more games than Ovechkin did. Ovie will take any opportunity he sees to score and don’t get me wrong, that is a good thing. You can’t score if you don’t shoot the puck. At the same time, it explains why he is such a phenomenon. Perhaps some of it is raw talent, but he works very hard, he’s an intense player and when you take that many shots on goal, you always end up with the amazing shots that miraculously cross the line. The lucky bounces, the strange angles and pushing the puck while he’s sliding on his face – they all end up on the highlight reels so that everyone can gush about what an amazing player he is. Having watched him all season, I am not as fascinated as everyone else seems to be. I have seen how hard he works for the empty net goals to pad his stats. I’ve seen him cherry pick when Backstrom and Semin set him up with perfect assists. I have also seen him steal a hat trick from Brooks Laich by taking an empty net goal in a 3-1 game against Toronto. Two of those three goals were Laich’s. That annoyed me greatly. Brooks Laich is one of my favorite players. He always gives 100% and is always a solid player. He and Nick Backstrom are two of the most consistently good players I have seen. We have a lot of talent on our team and some of the players who bring the most to the team are ignored next to the blinding glow of Ovechkin’s popularity. It’s not just those two either, we have an immense amount of talent on our team but if you are only listening to the commentators, game recaps and news stories you would think that Ovechkin was the only one who showed up to the game. Same goes for the Penguins and Crosby. How many casual hockey fans outside of Pittsburgh know who Evgeni Malkin is? While I am not a fan of Ovechkin, I can not deny what he brings to my team. He is a great player and a popular player. The problem is not what he brings to my team, but what he takes away from it. 90% of the Capitals merchandise you see on the market has the number 8 or the name Ovechkin on it. The Verizon Center is packed with #8 jerseys and crowds shouting “MVP! MVP!” every time Ovechkin scores a goal. He is undeniably talented and no matter what team he was on, he would be an MVP nominee as he is this season – the same award he won last season. I am glad that the Capitals are selling out every game, and I am glad we have made it through the first round of the playoffs. I hope we go much further. But if we do, it will not be because Alexander Ovechkin singlehandedly played forward, defense and did some goaltending during the line changes. It will be because the Washington Capitals are a talented team with a brilliant coach who benched our dead-weight goalie before it was too late. Give credit where credit is due, and as long as my team is in the playoffs, I will be cheering for the Capitals, not the Ovechkins. (And most certainly not the Mike Greens. Don’t even get me started on that!!!) It takes a solid team effort to win the Stanley Cup and if there is one standout player to take your team to the championship, it is never a forward, it is the goaltender. The Caps have an impressive new goalie but he doubled his NHL games played during the playoffs. We don’t yet know what he can do. On solid team efforts, I go with Boston Bruins and Detroit Red Wings for the Stanley Cup finals. When it comes down to goaltenders, I say Boston takes home the cup this year. I hate to admit when I’m wrong, but I would love to see the Caps make me do it! The Caps have a forward named Niklas Backstrom, and one of the Wild's goalies is also Niklas Backstrom. This explains the doubletake I did while watching the third period on NBC this past Saturday and heard the name. Okay, our Niklas Backstrom is from Finland, and yours is from Sweden, which I suppose means that ours is mostly depressed all the time while yours is singing ABBA songs, but that's not the kind of thing you can tell when the guys are smacking a puck around. Thanks for the commentary! Your hockey knowledge goes way past mine, so this is a fun education. I did a similar double take earlier in the season. Our player is Nicklas Backstrom (vs. Niklas, no c) and he's a phenomenal forward. Outside of DC, there there was much more talk about Niklas during the regular season. Of course, he is a starting goalie (and quite good) so it was disorienting at times to hear sports commentary about Backstrom's goals against & number of saves. D'oh! I should have seen that c--people who work at publishing companies should notice these things, even if they're only Web geeks and not official editors. I missed it because, umm, c is physics talk for the speed of light, and Nicklas went past me so fast I didn't notice it. Yeah, that's it; that's the ticket. So, has Backstrom ever scored on Backstrom? On the political front, the latest I heard is that our one actual senator has been floated as a possibility for the Supreme Court, which I think is a rumor started by someone in North Dakota. Still, if things break in some weird way and she ends up there, Minnesota could have no senators at all in a few months. Or maybe we'll get Norm and Al. Heh: NormAl. You are now an official sports blogger! !